Life has been in transition lately. Good, mediocre, up, down, cloudy, grey, with a hint of sunshine now and then. Spring in Wisconsin. But I have to tell you, I’m so glad I’m here to be good, mediocre, up, down, cloudy, and grey with a hint of sunshine. For about six months ago I took a tumble unlike anything I have ever experienced. I am here to tell you that I’m alive and well. As for the story…it was one of those things that could happen to anyone. A slick spot, a little curve, and before you know it you’re tumbling down the embankment on the side of the road. How instantly your life can change…in a flash, in one long, drawn out moment. Funny what thoughts come across your mind when you’re probably in shock and don’t know it. My husband was neither mad nor murderous. It wasn’t until I had the car towed home that I realized what I was had done was dance with the devil. I literally walked away from disaster. From paralysis and death and worse. Afterwards people told me stories of some who weren’t so lucky. I don’t know if they meant to make me feel better or not. Funny what thoughts come across other’s minds when they don’t know what to say. My life has not drastically changed since that dance, but every morning I say an extra thank you prayer. I call my kids and grandbaby more often. I always say something nice to someone — to their face, not behind their back. I know what’s important in my life. And I strive to be a better person. To my family, to my friends, and especially to myself. I smell the roses and and the green grass and keep an eye on the sunrise and the sunset. And I take a leap of faith and think that I was saved for a bigger purpose in life. Like keeping us all entertained. Mom had a car accident this winter. scary we were lucky hit another car but could have had same thing happen to us. Glad all is well now. Am glad she..and you..are okay too. Sad thing..my husband never wants me to drive now! Who’s paranoid now?? Good grief!! “And the award goes to Claudia Anderson for Mastery of the Understatement!” A little tumble, my hat! Ahh..but all’s well that ends well! So glad to see you here, Claudia. Those photos are pretty sobering. I hesitated to share them, but if they don’t advocate seat belts, I don’t know what will. 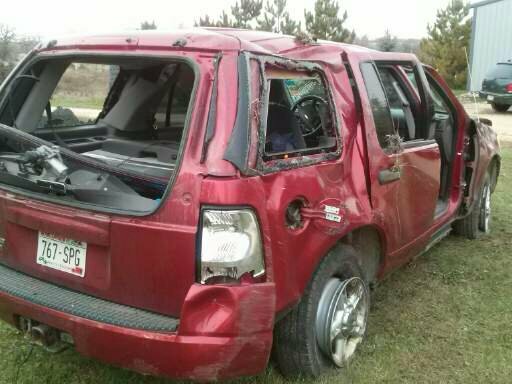 Thanks God for seatbelts Claudia, you live to tell the tale and pursue that bigger purpose! Oh yes! 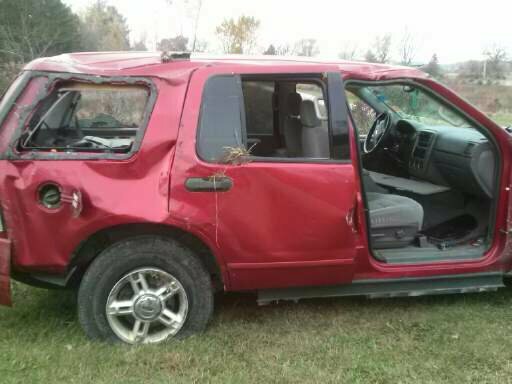 That seatbelt saved my life. And the strange thing was except for a couple of bruises and a jiggled brain, I wasn’t messed up at all. (more than normal, I add).